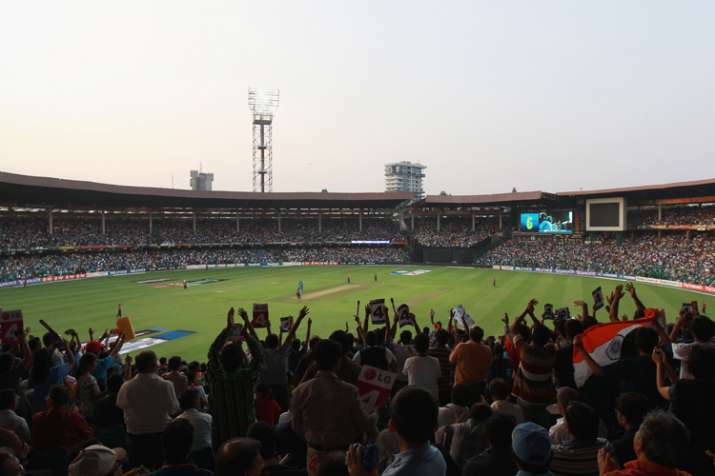 IPL 2019: Know more about M Chinnaswamy Stadium, Bengaluru, History, ODI, T20I, Test Cricket, IPL Match Records, Upcoming Event and Pitch Report at IndiaTV Sports. A general view of the M Chinnaswamy Stadium in Bengaluru. Situated in the heart of Karnataka's capital Bengaluru, M.Chinnaswamy Stadium is one of the major cricketing venues in India. Opened in 1969, the stadium was earlier known as the Karnataka State Cricket Association (KSCA) Stadium and was later named as a tribute to M Chinnnaswamy - the former president of BCCI. The stadium has a seating capacity of 40,000 and is home to the Karnataka state cricket team and Indian Premier League franchise Royal Challengers Bangalore. In a great initiative, the stadium became the first in India to use solar panels to generate a major chunk of electricty to run the ground. Since hosting its debut Test match in 1974 - between India and West Indies - the stadium has witnessed some of the biggest matches in India. The pitch in Bengaluru offers more pace and bounce as compared to other cricketing venues in the country. The short boundaries also makes it a heaven for batsmen.